This spring, I have been inspired by the French approach to parenting, and particularly, the importance French parents place on teaching their kids to eat well. Head over to read my reviews of Bringing Up Bebe and French Kids Eat Everything for more details on the books. These books nurtured a budding idea about the kind of parent I would like to be. I have no psychology or child development qualifications on which to base my theory, but I’m going to share it with you anyway. I think most of you are on the same page with this: A parent’s most important job is to build a foundation, and give our children the tools they need to live a healthy, happy life. Notice I didn’t say a “successful” life. Here’s why: I believe some parents focus so much on making their children some definition of “successful” they miss the more important life lessons. Lessons that many American adults (myself, and almost the whole millennial generation, included) didn’t get, such as having a healthy relationship with food, getting enough rest, living in the present moment, handling money, having a balance between work and all the other important things in life, and feeling like they belong to something big and meaningful. Having a foundation and framework for life that allows for both discipline and independence is what leads to success – you can’t skip straight to it. 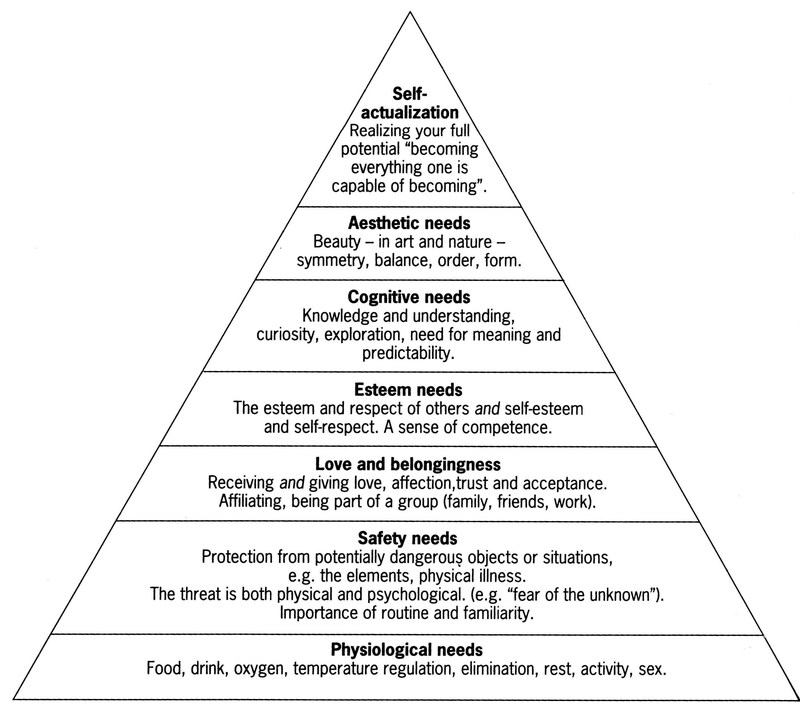 This idea of a foundation made me think of Maslow’s hierarchy of needs, from my Psych 101 days. It’s still a pretty useful model to explain what I mean. It seems a lot of American parents are focused on the upper half of this pyramid, from “Esteem” on up. They put kids in sports and activities where they can earn trophies, start them on advanced math at age 4, and protect them from the word “no” in an effort to bolster fragile self-esteem. But you can’t force, or even lead, children into strong self-esteem, intelligence, or self-actualization. A child’s journey to self-actualization is their own. As you work your way up from bottom to top, you’ll see that there are a lot of things parents can take care of or teach their children at the bottom, and a lot of things a child has to do for themself as we get closer to the top. The hierarchy of needs helps me to focus, as a parent. If I want to give him the ability to reach the upper rungs of the pyramid, I need to do my best to focus on meeting the needs I can at the bottom. But I have to do more than just meet his needs – I have to teach him how to provide these things for himself as well. This, I theorize, is how I can help my child grow into an adult who is well-prepared for the long and difficult journey up to the peak of self-actualization. And I can’t think of a more important place to start than with food. One of the main things I took away from reading the pair of French parenting books is how many life lessons can be taught through a focus on food: basic health and happiness, social interaction, pleasure, family closeness, manners, competence (helping grow or cook the food), an adventurous mindset (trying new foods is fun! ), a predictable schedule – and even math, reading, and science (measuring for a baking experiment, anyone?). The foundation of the pyramid may very well be the family dinner table! So, as I start testing out this theory of parenting (let’s call it “Foundational Parenting”) that’s where I’m going to focus my efforts this spring and summer. While I think my son already has a good start in this area – we were able to fight through a lot of issues to establish a solid breastfeeding relationship, and we’ve already exposed him to a vast variety of solid foods from all food groups and various ethnic backgrounds – I think there’s more we can do here. And let’s not pretend that by doing so, I won’t find benefits for myself as well. More on this tomorrow!